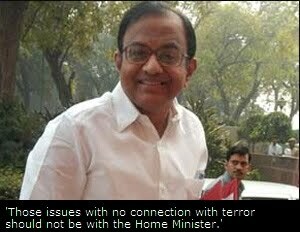 Mr. Chidambaram’s Ministry of Terrorism. Home Minister, P Chidambaram, doesn’t feel at home in the home ministry, at least in its present form. He was the 22nd speaker at the “Intelligence Bureau (IB) Centenary Endowment lecture” on 23rd December. IB was formed in 1887, just 30 years after what England called the ‘Sepoy Mutiny’ or 2 years after the formation of Indian National Congress, to monitor Russian troop deployment in Afghanistan. That 122 years later the AfPak region still continues to be the raison d’etre for the security buildup the world over shows how enduring some themes are. The theme of his lecture was – A New Architecture for India’s Security. His is an ambitious vision to reorganize the security apparatus beginning with the ‘Beat Constable’ to Police Stations (numbering over 13000 + over 7500 police outposts) to district level to state level and finally integrating the whole at national level. The sanctioned strength of the state police forces needs to be saturated quickly by recruiting over 400,000 persons from the present over 1.4 million. Authority of the state flows through the beat constable he contends when he says, “There is no substitute for the policeman who walks the streets. He is the gatherer of intelligence, the enforcer of the law, the preventer of the offence, the investigator of the crime and the standard-bearer of the authority of the State, all rolled into one. If he is not there, it means that all these functions are not performed”. The flows of information upwards & downwards that he finds are clogged both within and between different security agencies of the State; he wants to be made free flowing through an apex omnibus entity called the National Counter Terrorism Centre (NCTC) that would provide the necessary legal & administrative authority for the purpose. It would also have “Operations” directly under its wings. The necessary technology support will come through Crime & Criminal Tracking Network System (CCTNS) that will connect all police stations and would sit atop a grand database called NATGRID that will comprise of 21 sets of existing databases which are currently non-cooperative, and will be made to seamlessly, quickly & securely talk to each other. Finally, he wants to hive off what he finds are the non-core functions of the Home ministry such as, “Centre-State Relations, State Legislation, Human Rights, Union Territories, Disaster Management, Census, Freedom Fighters, Forensic science, etc”, either to a separate ministry or a department within the home ministry with a Minister having independent charge. A monolithic well oiled, well armed & better informed security apparatus that brings almost all security agencies under one umbrella seems to be his panacea for all the ills of terrorism. To that end he proposes to convert Ministry of Home Affairs into an ultra narrowly focused entity that would more appropriately be called Ministry of Terrorism and himself into a Terrorism Minister. Thisoverarching security centric architecture seems toonarrowly focused on “terrorism” to the detriment of all other more important approaches to address burning issues facing the nation. Is this view likely to make India more secure? On several counts his views run into infirmities. His survey of violence at the beginning of his talk raises important questions, “Can war be justified? It is a debatable point. Those who justify war point to the larger objectives of a war. That was the case in the Balkans, that was the case in Iraq, and that is the case in Afghanistan. The jury is still out”. Even if the jury is out, his mind is made up that war is justified. The 2003 murderous bombing & destruction of Iraq was based on mercenary consideration of ‘oil – the black gold’ and had no pretensions to ‘just war’ despite the initial blitzkrieg of lies by Bush-Cheney-Rumsfeld troika. When talking of bigoted Taliban & Al Qaeda, no mention of their having been fathered by Ronald Reagan by providing fancy weapons of destruction to them and mothered by Zia-Ul-Haq by lovingly coaching them in the tenets of extreme fringe of Islam is ever made. He thus conveniently avoids looking at the larger, more complex issues. He equates terrorist acts with insurrection/ insurgency and armed liberation struggle motivated by rejected ideology (Maoists?). Terrorists acts have following essential elements : victims are usually unrelated innocent people, targets are chosen to create abiding fear & panic, aim is to gain maximum publicity, and often hidden agenda is to foment large scale bloody sectarian or communal strife that would make governance impossible. All these elements are conspicuous by their absence in insurrection or insurgency. Point is not whether insurrection or insurgency is justified, but by equating it with terrorism misdiagnosis will result followed by maltreatment. His new architecture may be flawless in its body, but it lacks the soul. The security forces he so heavily wants to arm and rely on are often the problem rather than a solution. He is not unaware of this fact when he states, “A bad police constable is worse than no police constable. Recruitment must therefore be transparent, objective and corruption-free”. The cancer of corruption is far worse than any terrorist or insurgency threats India faces or is expected to face. It gnaws at nation’s vitals silently, steadily & inexorably. Its effect may not be bloody and dramatic but is far more pernicious, pervasive & abiding. It has eroded our polity, made government machinery venal & grasping, and has left the poor gasping by denying them even whatever little welfare schemes (PDS/ NREGA) have to offer. Moreover,State seems to demand sacrifices to be made by the rural poor and tribals for the sake of rich & mighty in the name of development. The notions of equity and justice seem to have escaped this vision statement. Creation of a Home ministry unencumbered by other considerations of good governance is likely to make it more blinkered than before and consequently far more vicious in its ‘armed solution’ of “whole jaw for a tooth”, “hundred eyes for one eye”, and may be even “1000 lives for 1 lost”. Terrorism Minister would also arrogate all the powers in the new dispensation thereby eroding completely the role ofcollective decision making by the cabinet and the moderating effect it is supposed to have. Lastly this overarching vision of security overshadows all other and far more important considerations of abject poverty, disparity, access to healthcare/ education/ livelihoods/ justice, etc. It shifts the whole discussion and debate onto a plain where addressing root cause of violence – the iniquitous structure of our society – is completely lost sight of and turns it into a murderous game where poor & voiceless turn into dispensable entities; where call to resistance by any means is not seen as an act of desperation in the face of the brutalized living they are forced to live, but is stigmatized as arising out of a perverted free & first choice. It would be instructive to have a look at how the first general election in 1951-52 unfolded in two disparate places : Bombay-> “….The workers came in far greater numbers as compared to the fashionable middle class.…in the industrial areas voters formed long queues long before the polling stations opened, despite the particularly cold & dewy morning. In contrast to this WIAA club [in Malabar Hill], which housed two polling stations, it appeared as if people straggled in for a game of tennis or bridge and only incidentally to vote….. Bombay had a great density ofpolling stations: 1349 in all, packed into just 92 square miles”. Contrast this with Mizoram -> “…..a tribal area bordering East Pakistan & Burma, required a mere 113 boothsspread over more than 8,000 square miles of territory. The people who lived in these hills have not known any queueshitherto except those in battle arrays. But they had nonetheless taken a strong fancy to the exercise, reaching their booths after walking for days on perilous tracks through wild jungles, camping at night on the way amid song & community dances around the fire. And so 92,000 Mizos, who have through the centuries decided an issue with their arrows and spears, came forward to give their decision through the medium of the ballot (p145, India After Gandhi)”. The tribes of Mizoram showed remarkable interest in & exemplary commitment to nascent democracy than the tribes of Malabar Hill. `But democracy since then has consistently shown loyalty & subservience to the tribes of Malabar Hill at the expense of real tribes & poor elsewhere. Why were the very same Mizos driven to long period of insurgency against the Indian State is what needs to be pondered over. 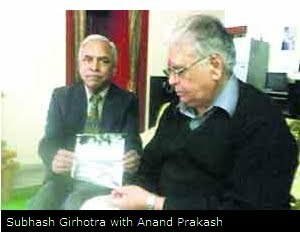 Ex-DGP Shambhu Pratap Singh Rathore, an awardee in 1985 of police medal for meritorious service and a recommendee in November 1999 for President’s police medal for distinguished service, is presently in the news for all the wrong reasons. While reams have been written about his gross misbehavior with a minor and subsequent extreme abuse of power to hound the victim & her family that finally culminated in her suicide; it is likely to go down as a case of one bad apple that brings bad name to the whole force. An editorial in a frontline newspaper says, “The case shows once againhow inept the system can be, by design or otherwise, in speedily processing cases. Prompt registering of an FIR, a speedy trial and swift conviction might have prevented the many horrors that followed Rathore’s original crime. Besides, when there is clear power asymmetry between the perpetrator and the victim, the judicial process must be extra-sensitive to protecting the victim and complainants against retribution. S.P.S. 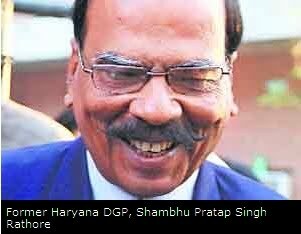 Rathore was even at the time of the crime a powerful officer; in a shocking act of political indifference, he was promoted all the way to eventually become Haryana’s DGP”. Can there be more severe indictment of the way things are? Do we still need proof that the whole system is rotten, corroded, and has become the bad barrel that can safely hold only bad apples? Good apples get a feeling they have no place in this dispensation. If the victim’s father is driven to say that “…..there is no reason for us to have a belief in the system”, is he to be faulted? These police forces & other security agencies are Chidambaram’s weapons of choice to bloody the people who have been denied every reason to believe in the system, who have been given every cause to distrust it, and who have been left with no stake in it. He needs to pause and ponder over the truth in self-serving statements that appear in the mainstream media such as, “Maoists need to be flushed out of tribal areas, so that development can be pushed in”. As if, it is because of the Maoists that government couldn’t do anything in the tribal heartland for last 62 years. It is like deliberately disguising the effect as the cause. The truth however is that tribal heartland has seen government machinery only as feeding off it and repressing its protests violently that gave the toehold to the Maoists to enter the scene & prosper. If he is serious aboutfinishing the Maoists and not finishing off the tribals, then he needs to move around tribal heartland sans his security forces in the company of grassroot activists to see reality as it is. But that would requiresincerity of purpose & courage borne out of conviction. Can he muster both?